"Where'd you get the lead screw?" "Amazon.com, in the aviation section." A ferry pilot, having a cup of coffee before pulling a 747 from flying storage in Mojave, stares at the contraption on the wingtip of my beleaguered KR2S. We're getting ready for a video flight to show the articulating boom in action, and it's drawn some attention from the usual crowd of pilot-y folk. The story starts a couple of weeks ago, over a sandwich and a coffee at Stoken Donuts. 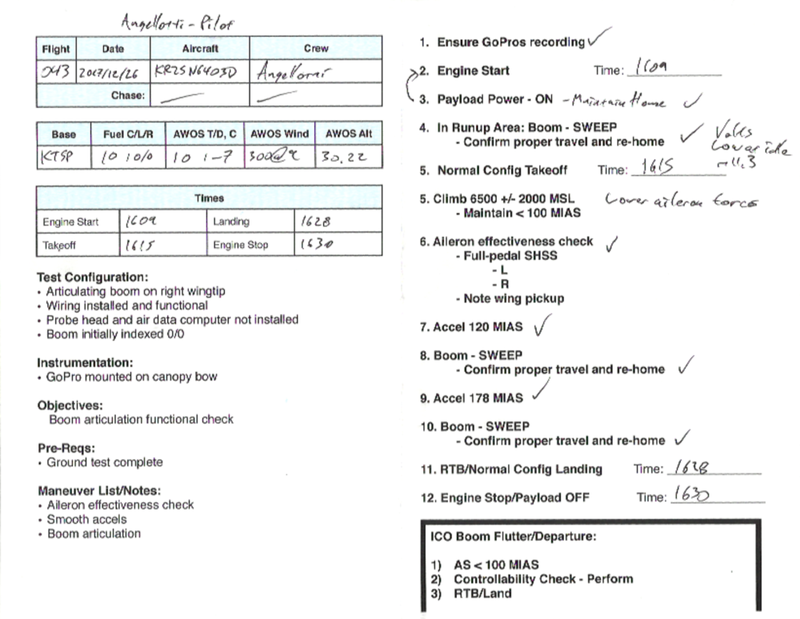 I had a pile of data from an entire day's worth of tower flybys with the boom mounted at varying beta. We'd lost everything after the 0-beta points in a data goof that was undeniably my fault, and I'd pulled the brain trust together to evaluate my next bad decision: building an articulating boom. The idea was simple - we had a boom calibrated for normal flight alpha/beta, we just needed to expand that cal range to find out where the Kiel probe fell off the edge. I wanted to do this without burning much more than the brain trust's lunch hour, so I decided to mount the calibrated boom on the left wing, and calibrate a duplicate at varying angles on the right wing. It was a pretty simple logical leap to build an actively articulating boom, and it made a lot of sense as a stepping stone towards calibrations at higher Q that would require much more efficient test routines. It would also make for a more manageable calibration of a 5-hole probe. The next week, I sat down during trivia night at La Mesa's best coffee joint and got some STL files ready to print. The design is simple in concept - one NEMA 17 stepper motor rotates the boom in yaw using a lead screw, and another is mounted on the traveler to allow the boom to rotate. A two-axis cantilevered gimbal is integrated into the forward mount, and a bushing allows the boom to slide back and forth slightly as the traveler moves from side-to-side. The stepper motors are powered by a pair of 4-conductor shielded cables run along the wing and through a NACA vent (cabin air - an extra) in the right fuselage side to get to the stepper motor drivers mounted on the baggage shelf behind the passenger seat. A Raspberry Pi Zero W automates the sequence, and it's rounded out by a 5A payload breaker and a "go button" mounted in some spare panel space. 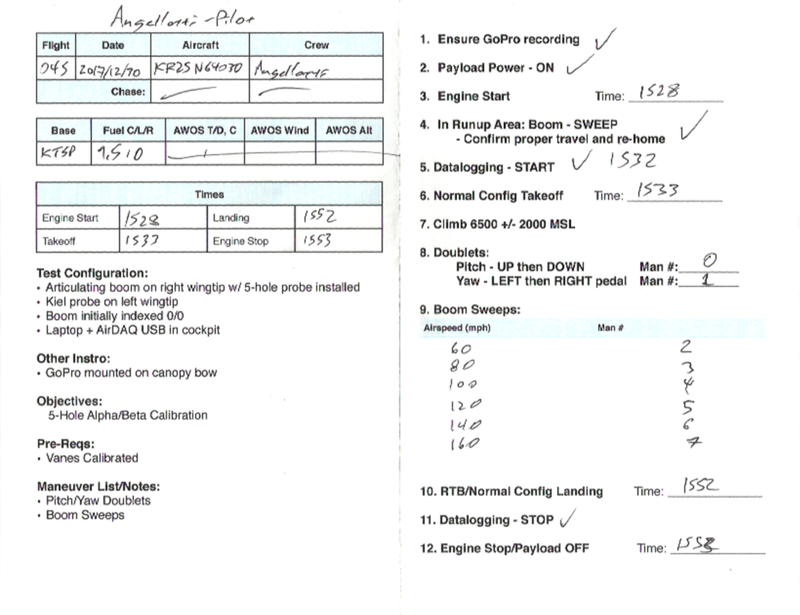 Integration went smoothly, and the final install looks remarkably like the original napkin sketch - a rare occurrence! 1) We'd mounted a lot of structure to the top of the wing and in front of the aileron, so we were concerned about potential flying qualities impacts. Our mitigation for this was to perform the first flight with a minimum of installed parts - no wiring, no probe tip, and no boom on the left wing. After confirming no negative impacts, we added the wiring and other components and repeated the test. This minimized the chances of finding a major "surprise" that we weren't ready for. 2) Since this is a bigger and heavier contraption with more moving pieces than what we typically fly, boom flutter/departure resulting in damage to the airframe was also high on our list of things to worry about. To mitigate this risk, we performed a lot of pull tests on the ground to confirm the structural integrity of the hardware. We also mounted it outboard of flight controls as much as possible. In flight test, envelope clearance was performed progressively, starting at 120 MIAS and working up to 178 MIAS, with stick raps and wind up turns. The objective was, again, to find any issues while everything was lower-energy to minimize chances of damage in the event of flutter. 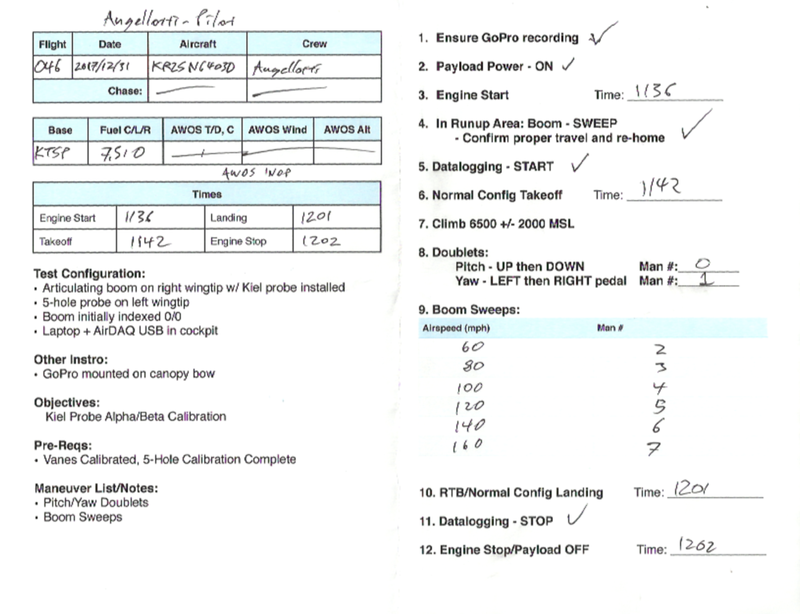 From first flight through collection of the target data set, 5 flights were completed - two envelope clearances flights, one video flight, and two data flights. I'm particularly proud of the test efficiency we achieved in this program - the longest flight was the photo flight, clocking in at 0.6 from chocks to chocks. The dataset is nothing short of unreal, offering new insight into the performance of the Kiel probe. There are a lot of interesting things to pull out of the data, but the biggest takeaway is the behavior of the Kiel probe compared to a more typical pitot probe. We can see substantially reduced recovery error at high AoA. Also worth noting is that the presence of the exit ports forward of the static port doesn't cause a visible disturbance in the static port - this concern was voiced by a lot of colleagues and it's really great to have data to put it to bed. This project was a huge success. In the space of a couple of weeks, the idea went from a napkin sketch to a functional test rig, with full envelope clearance and real, live data. This wouldn't have been possible without help from the community that supported this whacky idea - without making everyone blush too hard, here's a list of people I have to thank for making this project possible, organized by estimated height from tallest to shortest.